An extremely rare trace fossil of footprints laid down more than 300 million years ago was brought to the Museum recently by ten-year-old schoolboy Bruno Debattista. 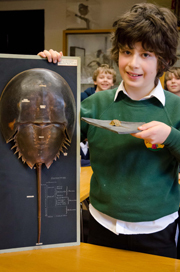 Thinking that the piece of shale rock he had collected while on holiday in Cornwall might contain a fossilised imprint, Bruno showed the specimen to our Education department’s Natural History After-School Club, which he had been attending each week. Despite the long odds of finding such a trace fossil, our geologists and education staff were excited to see what appeared to be the trackways left by a horseshoe crab, crawling up the muddy slopes of an ancient shore. These tracks were laid down during the Carboniferous period, some 308-327 million years ago, at a time when the sea was slowly being sealed off as the Earth’s landmasses crunched together to form Pangaea. Although an animal’s harder body parts, such as shell or bone, are more likely to become fossilised, trace fossils such as footprints are incredibly rare and extremely hard to spot. You can just see the faint trail left by the horseshoe crab, running top-left to bottom-right of the specimen here. Bruno was specially selected for the Natural History After-School Club by his teachers at Windmill Primary School after showing a particular interest in nature. His extraordinary fossil find should be enough to spark enthusiasm in any would-be naturalist. Bruno and his family have kindly donated the specimen to the Museum’s collection.